Even before it opened in theaters over the weekend, It, the adaptation of Stephen King’s novel about a group of preteens terrorized by the sewer-dwelling Pennywise the clown, had already spawned a sequel. 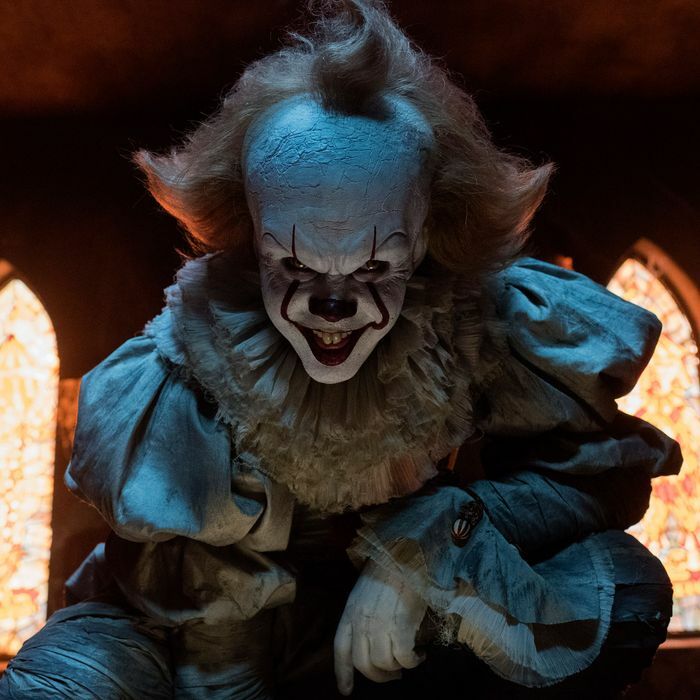 But now that It has made an astonishing $123 million in its opening weekend, it seems fair to assume we’ll see It sequels of another sort: even more films and TV shows featuring scary clowns. But America, I ask you: Have we not, as a society, already reached peak scary clown? The biggest movie in the country right now, which has been hyped for months, stars a homicidal, balloon-carrying Bozo. American Horror Story: Cult is packed with seemingly real clown terrorists who are running rampant through the homes and grocery stores of suburban Michigan. Hollywood is planning multiple movies centered around the Joker, who, sure, is a comic-book villain but, at his essence, also a scary clown that we have seen in many films, TV shows, cartoons, books, and video games for decades. The fourth season of BoJack Horseman features a subplot about scary clown dentists, which, honestly, is a new subset of clown horror that I had never before considered, so I have to give a shout-out to the BoJack team for being pioneers in this otherwise thoroughly explored circus ring. And then there are all the insane posses of clowns in reality, like the juggalos who plan to gather in Washington, D.C., this weekend or the actual creepy clowns who freaked out kids (and adults) in towns across the country last year. It’s like every day is red nose day all of a sudden. Even Bart Simpson, who has much, much love for Krusty, understood at a very young age that Clarabelle and his ilk are disturbing. If you’re an artist who crafts scary stories, it’s natural that you might decide to create a monster using some big shoes and a horn that goes honk-honk. The idea that white makeup and a red upside-down frown can serve as mere camouflage for a killer is one that mainstream and fringe pop culture have played with for decades. The particular clown that first struck fear in your heart likely depends on your age and media consumption habits. For some, it was unquestionably Pennywise, either in It book or TV mini-series form. For others, it may have been Jigsaw from the Saw movies. For me it was the clown doll in Poltergeist — a film that scared the friendship pins right off my shoelaces — that got me, especially because that toy was vaguely reminiscent of a talking doll that we had in my house growing up. I made sure that menace in the polka-dotted puffy shirt was nowhere near my bedroom post-Poltergeist; it’s possible I also asked my parents to apply for a restraining order requiring said doll to remain at least 50 feet away from our home at all times. No matter which clown haunted you first, once it happened, the instinctive desire to recoil at first mention of Barnum and/or Bailey most likely stayed with you. Even though the creepy clown has been around for a long while, though, it hasn’t felt quite as omnipresent as it has during the past couple of years, and may feel in the years ahead. That makes me wonder if we will become so accustomed to the “Chuckles Is Evil” trope that the idea of the scary clown will start to lose some of its power, especially for kids and teenagers growing up during this boom time for Bozos. If you’ve spent some time on YouTube or are around kids who consider it their favorite TV network, you may be aware that scary clown videos are a very robust subgenre on the platform, so much so that while seeking out scary clown videos, YouTube may suggest refining your search terms to say: “scary clown videos for kids” or “scary clown videos for children,” which seems pretty oxymoronic. Some of these are even made by children, for children. I’ve managed to keep my fifth-grade son safe from most of these mini–American Horror Stories, but I have caught him watching a clip made by Ruby Rube, a young and popular British YouTuber who has created a niche for herself by making short films in which she is freaking out about something bizarre that’s allegedly really happening, usually at 3 a.m. (3 a.m. videos are a whole other YouTube subgenre.) “Oh my gosh, guys,” as said in a panicky British accent, is basically this kid’s catchphrase. She has posted several videos about clowns, and when I immediately told my son to turn off the one he was watching because it might be scary, he was completely unfazed. “It’s not scary,” he told me, which was true. It wasn’t, because it was obvious that it was fake. So in addition to being exposed on some level to the excessive clown-spreading in pop culture, today’s young people have probably seen enough videos of people being pretend chased by YouTube clowns to be at least somewhat blasé about clown-related imagery. Well, unless some stupid adults took them to see It over the weekend, in which case all bets are off. All of this makes me think that in the next few years, Hollywood is going to have to come up with some other iconic diabolical figure to inspire terror because the next generation of horror-movie fans could be all clowned out by the time they’re old enough to see R-rated screamfests. As for those of us who have grown up with either mild or extreme forms of coulrophobia, perhaps even we will feel as though we’ve gone through the equivalent of exposure therapy that has cured us of our anxieties, or at least made us less likely to gasp at the sight of American Horror Story’s Twisty and his equivalents. Then again, maybe there will always be enough people who feel like young Richie does in the It remake: perpetually afraid of clowns and, upon entering a room with Pennywises in every dark corner, even more afraid than they’ve ever been. I’m pretty sure studio executives are banking on it.